On February 5-12, an international week of solidarity with Russian anarchists took place. 21 actions against repression were joined by 21 Russian cities and a large number of foreign comrades, from Belarus to the US and Canada. Information materials, leaflets, graffiti and stencils were distributed, banners were posted informing about repressions against anarchists. Actions were held in Kaliningrad, Altai, Kursk, Novosibirsk, Samara, Kemerovo, Astrakhan, Volgograd, Rostov-on-Don, Izhevsk, Penza, St. Petersburg, Moscow, Nakhodka, Chelyabinsk and Vorkuta. Pickets informing about the terror of the FSB against anarchists wer held in Yekaterinburg, Kandalaksha, Tomsk, Sochi, Moscow, St. Petersburg, Saratov. In Samara, an evening of solidarity was organized. Visitors were told about repressions against anarchists and about the basic rules of conspiracy. After that, the film “Sacco and Vanzetti” was shown, the story of these people clearly demonstrates all the inhumanity and uselesness of the state system and the methods that it has used, to this day, to suppress any protests. Solidarity actions were also held in other countries. In Belarus, anarchists distributed leaflets informing about then persecution of Russian anarchists. In Lutsk, Ukraine, there were also grafitti in solidarity with Russian anarchists. Actions of solidarity took place in Warsaw, Gdansk (Poland) and Prague (Czech Republic). In Prague, Czech Republic, a concert was held in support of repressed Russian anarchists. At the concert information was spread about repressions in Russia and money was raised for the Anarchist Blac Cross, which provides assistance to political prisoners. Also fundraising was carried out in Estonia at concerts of musical groups Ognemöt, Adrestia and Prophets V in Tallinn and Tartu. Also, an event to inform about repression in Russia and fund-raising was held in Budapest, Hungary. In France, a solidarity dinner was held, the funds from which were directed to support the Russian anarchists. Also, many solidarity events took place in the United States. So, in Minneapolis there was an evening of solidarity, in Brooklyn – a film show. Antifascist online store from Portland spread information about repression and raised money to support the repressed anarchists. In Kansas, a street demonstration was held in support of Russian anarchists. 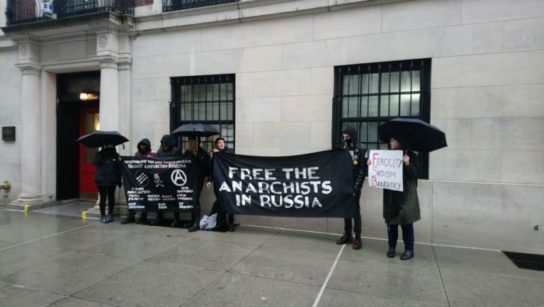 In New York, a picket took place at the Russian consulate. Also, representatives of the Revolutionary Abolitionist movement from New York expressed solidarity. Solidarity action was held in Toronto, Canada. Anarchists held a picket on the most crowded square in the city, informing passers-by about repressions in Russia. The week of solidarity was held in solidarity with Russian anarchists, subjected to repression by the FSB. In the fall of 2017, the FSB arrested six anarchists from Penza. The reason for the arrest was that all the six played airsoft, which was regarded by the secret services as a training for the overthrow of state power. Weapons were implanted to the detainees, they were accused of organizing a terrorist community. For months, the detainees were daily tortured and beaten until they agreed to slander themselves. They were hung upside down, beaten, tortured with electric shockers. In January 2018, several anarchists were kidnapped in St. Petersburg. Two suspects and one witness were seized, all of them were tortured. One of the detainees for this purpose was taken to the forest near the city. Another detainee was tortured for more than a day. Only officially the interrogation lasted a day – from three o’clock in the morning until three o’clock in the morning. Although one of the suspects and the witness made a statement about the torture, their statements were not checked by the state authorities. The FSB is announcing plans for arrests on the fabricated case of a terrorist group of two dozen anarchists in Moscow, St. Petersburg, Penza and Belarus. Also in the Crimea, special services detained a local anarchist and social activist Yevgeny Karakashev. The reason for the detention is the active participation of Eugene in the social struggle of the inhabitants of the peninsula. On the day of the arrest, the Mayor of Evpatoria met with protesters against point-building and made a hint about possible arrests. The reason for the arrest was Yevgeny’s correspondence in a group chat in social networks. Immediately after the end of the week of actions in support of Russian anarchists, repressions were continued in Moscow. On February 13, early in the morning, an anarchist Elena Gorban was arrested. In violation of all norms, the lawyer was not admitted to Elena for several hours until she agreed to admit guilt in the pogrom of the office of the ruling Russian party, “United Russia”. On the same day, anarchist Alexei Kobaidze was detained and arrested for the same charge. 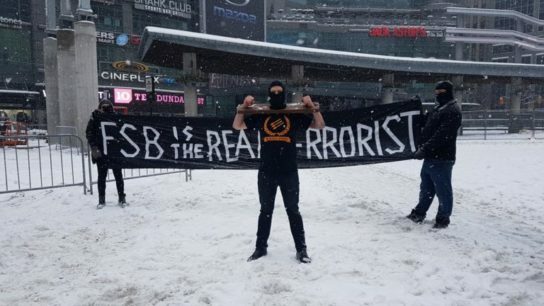 The reason for the arrests was an unauthorized demonstration in Moscow against the FSB terror. 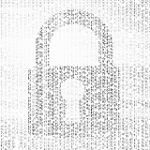 Early in the morning, before the appearance of information in the media and the Internet about the arrests of anarchists, the pro-government telegram channels published a video of detention and a message that anarchists taking part in the demonstration had been detained in Moscow. The investigators who questioned Elena also ask her about the demonstration although the detainees were charged with the pogrom of United Russia, and not participation in the demonstration. After the arrest, actions of solidarity were continued in Russia. In Chelyabinsk, anarchists placed a banner near the FSB building and threw a smoke bomb to its territory. And in the suburbs of Moscow a mobilising raid was held in solidarity with the repressed anarchists. We are calling upon everybody to continue the solidarity campaign!